I’m on the record as a huge fan of Nickelodeon’s anime series The Last Airbender. Not only is it one of the finest animated series ever made, it ranks right up there with Breaking Bad, Mad Men, Community, and Lost as one of my favorite TV series of all time. When I first heard of the sequel series The Legend of Korra, I was both excited and nervous. It would be tricky for creators Michael Dante DiMartino and Bryan Konietzko to move forward in the Avatar world while still maintaining the epic and hilarious tone that made Airbender work so well. Set nearly seventy years after Airbender, Korra begins as a Southern Water Tribe teen named Korra moves to Republic City to begin her training as an airbender and complete her evolution as the new Avatar. Republic City is a joint effort where citizens from the world’s four nations can live in peace and harmony. The city was formed after the war that Airbender depicted by Aang and Zuko and was meant to be a beacon of hope for a new world. 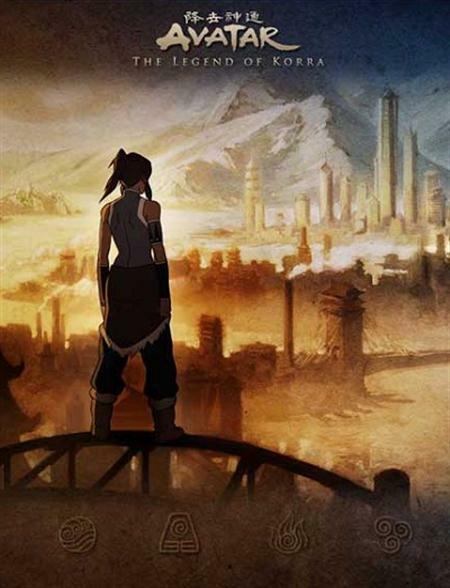 Korra discovers that the dream is far from a reality and Republic City is in dire need of some law and order. The boldest move DiMartino and Konietzko make is their refusal to dwell on the past. All the beloved characters from Airbender are either long dead or incredibly old. In the first two episodes only one character from Airbender makes a physical appearance, and a few others are seen as statues and memorials that litter Republic City. Surely fans will learn of their favorite characters’ fates throughout the series, but right now all that matters is Korra and the world she’s inherited. However, instead of traveling that world Korra seems content to remain restrained to Republic City. There’s a great deal of civil unrest as well as an anti-bender movement afoot, so the new Avatar will have plenty of conflict on her plate. Just like Aang, Korra has plenty of help. There’s Tenzin, the uptight airbending master who happens to be Aang’s son. There’s the brotherly duo of Mako and Bolin, one an earthbender the other a firebender, and both equal in the looks department. There’s also Lin Beifong, the chief of police who has her own history with Tenzin and Aang. Korra’s chief adversary seems to be the shadowy figure Amon, the lead of the anti-bending movement who spends the first two episodes hidden in shadow and behind a mask. The first two episodes–“Welcome to Republic City” and “Leaf On The Wind”–do a great job setting the stage for the evolution of the Avatar world, and I’m plenty excited to see where The Legend of Korra goes next. The show has a big act to follow, but it looks like it’ll have no problem pulling that off. The Legend of Korra hits the air on April 14th, 2012. You can download the first episode via Amazon right here. Comments for TV Review: “The Legend of Korra” are now closed.